I got these nail stickers as a present last year, and have never got round to trying them out yet, so during the weeks holiday i thought i would give it a go. My nails at the moment are rather shorts and bitten so i used them on top of fake nails to get the full effect. This is a bit of a rubbish photo as my proper camera is broken at the moment, sorry! 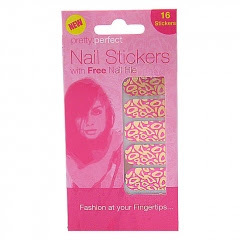 I did a bit of searching and found an image of the exact stickers i used on google, Nail Stickers by PrettyPerfect which are available in Boots and Superdrug but i have also found them on Amazon for incredibly cheap! They are a sort of metallicy hot pink and gold animal print design, not a pattern i would usually pick out myself but they did look good once applied, better for going out rather than a day-to-day accessory for me. The only downfall i found with these stickers is that they were quite difficult to apply, maybe its just my impatience but i found quite a few of the stickers didnt go on smoothly as you can sort of tell by the rubbish quality photo. Stickers like these come in all different colours, designs and brands so i will definitely be using these again, and recommend that you do too! 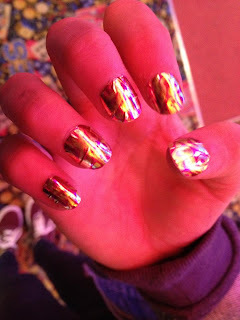 Love these nail art stickers, have been wanting to try them for ages but still havent!